Home of the Gerald Ford Museum! Gary's critical review of The World is Flat and the education community's knee-jerk reaction to it. Will Richardson has written perhaps the best "how-to" book for computer-using educators since Dan Watt's Learning with Logo in the 1980s. Will's book, Blogs, Wikis, Podcasts, and Other Powerful Web Tools for Classrooms is a must have for every educator or citizen interested in understanding Web 2.0! MySpace Unraveled: What it is and how to use it safely by Larry Magid and Anne Collier takes the incredibly novel position of suggesting that you know what you're talking about before setting policy at home or in school. The book teaches adults how to use MySpace.com so that they may more rationally discuss social networking with children. Macarthur Genius and school principal, Deborah Meier's book In Schools We Trust: Creating Communities of Learning in an Era of Testing and Standardization is an incredibly important read for all school leaders. Excited about the possibility of emailing a bicycle? You must read Fab: The Coming Revolution on Your Desktop--From Personal Computers to Personal Fabrication by Neil Gershenfeld. Learn about "micronations" and think of creative curricular connections. Lonely Planet has just published a tour book for those of you interested in traveling to some of the world's micronations. Unfortunately, Talossa is no longer accepting reservations. Read Lonely Planet Micronations. You can find many of my favorite education book recommendations organized here. Senior Editor Gary Stager interviews Don Knezek, CEO of ISTE, on the revised National Educational Technology Standards(NETS). Plus: Stager's perspective. Let's all make a simple New Year's resolution. This educator's latest book shines a bright light on what he calls this country's big shame -- not only are cities segregated, but the education we offer those city children is markedly worse. Get the free SWIKI collaborative software for Mac, Windows and Linux here. A fantastic site for young people all over the world interested in making the planet a better place to live. Employ student tech skills and leadership as partners in teacher professional development, curriculum integration and tech support. A terrific profile on Wikipedia, it's users and it's creator from Wired. Filmloop - personal current favorite! Information wants to be free. Learn about it all here. Gary Stager's role in the history of classroom-based "laptop learning" is documented in the book, Never Mind the Laptops: Kids, Computers and the Transformation of Learning, by Bob Johnstone. Gary Stager is one of the authors of the recently published TechYes! Student Guide and Implementation Guide. TechYes! is a revolutionary product that allows middle school students to earn computer literacy certification through the creation of personally-meaningful peer-reviewed projects. Windows users can record and publish audio using nothing more than a browser! Microsoft's amazing mapping project. Find the car in your driveway! Learn what a huge impact MySpace is having on the music industry. ISTE's vague standards and an exclusionary "seal of alignment" make one wonder whose side the group is on. The great thing about Gary is that he never gives up. He was there at the beginning of the great transformation of learning via the medium of portable computers, at the first school to implement laptops, Methodist Ladies College, Melbourne, in 1990. Fifteen years later, Gary's still at the forefront, still showing the way, still walking the walk in his inimitable style. His work - particularly among the most challenged students, like the juvenile offenders incarcerated at the Maine Youth Center -- provides conclusive proof that kids can learn better through the intelligent use of technology. 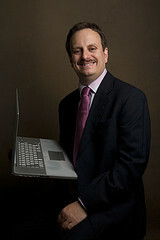 Gary Stager is one of the true pioneers of the 1:1 laptop movement. His work in this area includes looking beyond the laptops to their effective application by students as true tools for learning. Rather than seeing 1:1 computing as a vehicle for replicating older educational models, Gary sees it as a chance to transform educational practice in ways that truly prepare young people for lifelong learning. Blocked Web sites, IT staff that exist to hinder staff, and restrictive policies make integrating technology too hard to overcome. No other column by Gary Stager has generated so many negative responses. Inspiration for The Year Ahead from some of America's leading educators. With so many vital sources of information available to students, why are schools slavishly holding onto textbooks? Digital textbooks may be worse than the real thing. For 25 years, Gary Stager has helped learners of all ages across the globe embrace the power of computers as intellectual laboratories and vehicles for self-expression. He led professional development in the world's first laptop schools (1990), designed online graduate school programs since the mid-90s and is a collaborator in the MIT Media Lab's Future of Learning Group. Mr. Stager's doctoral research involved the creation a high-tech alternative learning environment for incarcerated at-risk teens. He is Senior Editor of District Administration Magazine, Adjunct Professor at Pepperdine University, author of the regular feature, Exceeding Expectations, for Apple Computer and an Associate of the Thornburg Center for Professional Development. In 1999, Converge Magazine named Gary a “shaper of our future and inventor of our destiny.” Gary has worked with schools, conferences and other institutions around the world and welcomes the opportunity to speak at your next event or design effective professional development services for your school. In September 2006, Gary became the Editor for the online publication, The Pulse: Education's Place for Debate.